If you are near London between 4 and 21 September, this is a must-see exhibition of more than 50 early works of Alexander Volkov. It is the first exhibition of his works outside Russia and Central Asia. Born in Ferghana in 1886, Volkov spent his life in Uzbekistan, apart from studies in Kiev and St. Petersburgh. 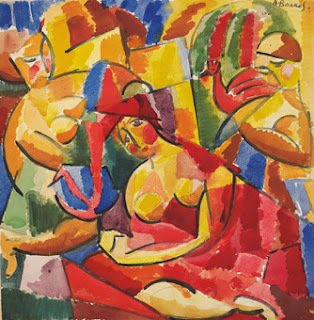 For artists, the 1920s in the Soviet Union was a heady period of experimentation, inventiveness and colour. Volkov was one of the founders of the Masters of the New Orient group in Tashkent and his dynamic, exuberant works from this period fuse modernism with orientalism. It is said he used to wear Renaissance velvet pantaloons while walking the streets of old Tashkent. He was regarded with suspicion by the Soviet authorities and later, during the final years of Stalin’s rule, he was accused of “formalism”, banished from artistic circles and isolated. He died in 1957. Thanks to Igor Savitksy, over 70 paintings and 21 graphics by Alexander Volkov are held in the Nukus Museum. On Uzbek Journeys tours you spend an entire day there: it is one of the highlights of the trip. You also have the chance to view Volkov's work at the Tashkent Fine Arts Museum. Christie's is at 8 King Street, St James's, London. The exhibition runs from 4 through 21 September. Open daily from 10:00 am - 5:00 pm; entry is free. The works are not for sale. View the special Christie's exhibition video below [3.5 mins] in which Evelyn Heathcoat Amory, Specialist in Russian Pictures, discusses the exhibition highlights. Ensure you watch in full screen mode to fully enjoy the preview.